ASTER, Friendship Ring, Dresden Plate, or whatever you call it, this quilt is certainly one of the prime favorites of today. 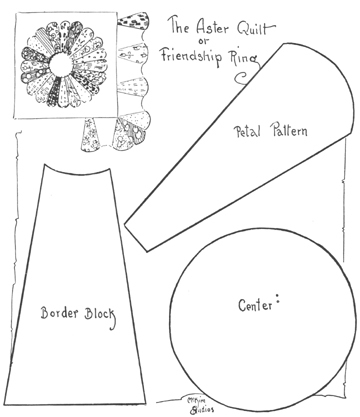 Like the Wedding Ring, it uses as many variegated prints as can be assembled, hence the "Friendship Ring" part of its name as one usually has to call upon many friends for a proper assortment. Sew the twenty petals together, then turn in around the outside scalloped edge and whip onto a fifteen-inch or larger background block of white or unbleached muslin. The center circle whips down last to finish the block and then the white underneath may all be cut out if so desired. 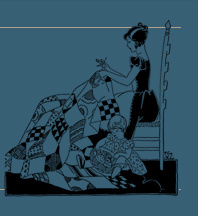 Twenty-five blocks make a full size quilt, or twenty a twin size, with border as sketched, about 85 by 85 inches. Material Estimate: Seams are not allowed, so cut enough larger than your pattern to allow for them. You will need 10 yards of material: 7 yards white or unbleached, and 3 of assorted prints-about 1/6 yard of each is the least one can buy.